Thirty Seconds to Mars have been on my Bands To See Bucket List since they released This Is War, which is also before I realised front man Jared Leto was also an actor. It was the younger Leto brother’s dual celebrity that played on my mind when seeing his band play Manchester Arena last Saturday night. The stage was placed towards the centre of the arena, hidden at the start of show by video screens that provided the multi-coloured back drop to the show. It was this that made it apparent that we weren’t getting any support bands. This was all about Thirty Seconds to Mars. As the band entered, though, it became apparent that this was all actually about the Leto brothers with a third band member (presumably Tomo Miličević) demoted to floor level to play what appeared to be more instruments on his own than the other two put together. Jared entered the stage wearing a poncho that would have been at home in a Tim Rice and Andrew Lloyd Webber musical, red trousers, sparkly gloves and my general bugbear of sunglasses indoors. This prompted the first half of a set that included mainly twirling around and sing backs from the crowd. Given how little of a band was there, though, a lot of the sound being generated seemed far louder and fuller than the crowd could generate. I suspect that a lot of what we were seeing was originating from a pre-recording on a computer, though – especially the bits that the crowd were asked to sing that seemed a lot louder than the interaction around me would suggest. Throughout it was obvious that Jared was valuing being an entertainer over being a front man. It felt like he was acting the part. That was until he took off the stupid costume and the sunglasses which seemed to prompt him to talk to the audience more and become closer to what most / some / I had come to see. Sure, there were still issues. The quiet parts of songs were inaudible with an audio clearly set up to honour the soaring vocals that were often given to the audience to sing anyway. Fans milked on stage appearances and we even had a marriage proposal. A tweet to Theresa May from an audience member from Jared’s account felt absurdly punk rockish and out of place as the substance of political statements were lost in the show. Announcing at 21.40 that they only had time for one more song unless the audience wanted two was text book, but ruined by the fact that the Arena’s curfew is 23.00 and that Jared forgot most of the words to Vox Populi anyway. The show was entertaining, and I didn’t not enjoy it. Most bands, though, will start at a small venue and build up to arenas. It felt to me like Thirty Seconds to Mars need to do the reverse if they want to be an honest band not built off the back of Jared’s acting. Go to a small venue and put the three or four or however many people they need on stage with their instruments for all to see even if it means stripping back some of the songs, and play hard. 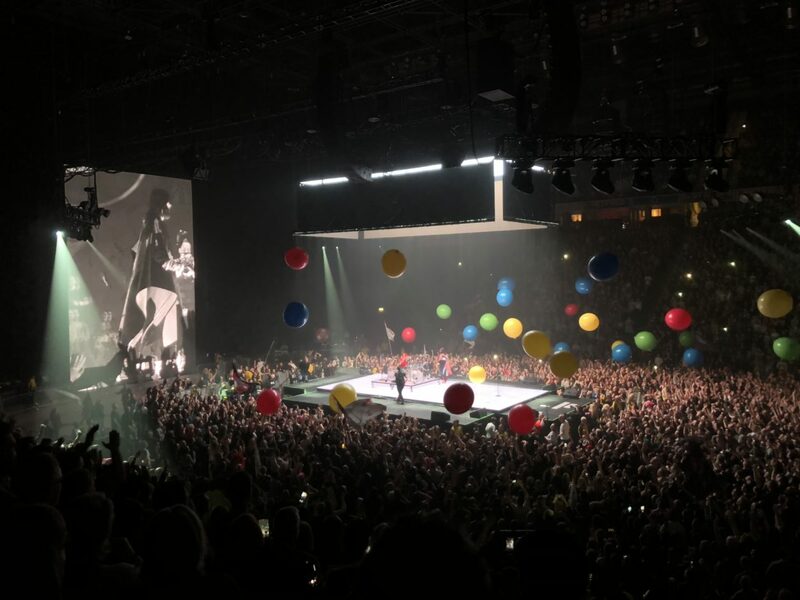 The show at Manchester Arena on Saturday felt like that of a band that hadn’t yet earned their stripes in that situation, which is odd to say of one that has headlined festivals. It felt a little like a group acting as a band and making a good job of it, but I went for a concert and for the music and, in that sense, I was left disappointed.